We have a new Pope, and the revelation of the man selected was a surprise to pundits Catholic and secular both. I remember what this felt like last time, and this is so very different. Then, there was so much sorrow from the death of John Paul II, the only Pope I'd known. 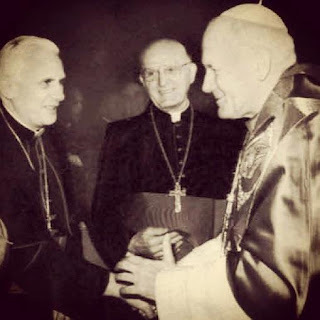 But by his side for many, many years was another man I loved and admired a great deal: Joseph, Cardinal Ratzinger. The disbelief and utter joy I felt at the announcement of his election was powerful. I couldn't believe it was true; it was so unlikely that a man who had served for so long and talked about retiring so often, a man we knew so well would sit in the Chair of Peter. This time I didn't know any of the Cardinals well, though I knew there were good men among them. I was very aware I’d have to get to know the next Successor of Peter from scratch. I didn’t recognize his name at all, and must admit that when he first stepped onto the balcony, I was uncertain how to interpret the way he stood so quiet, so still, as the crowd cheered his appearance. For a brief moment my heart sank, worried that he might be stern or unapproachable. But then he smiled and greeted the people with, “Buona sera” and I was instantly reassured: it was going to be all right. And then he led us in prayer for Benedict and my heart was completely won over. And when he bowed so deeply, so humbly in front of the millions of people watching, to accept our prayers, I was humbled and my respect for this unknown man went deep. God, in His gentleness and regard for our free will, asks us to accept His calling rather than imposing it on us. 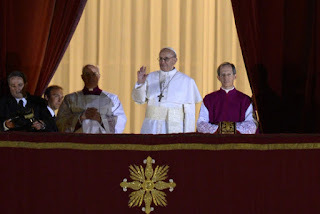 I felt very strongly as I watched Pope Francis on the balcony Wednesday night that he had been asked to accept this specific yoke of service, and that he said yes, freely and wholeheartedly. He very clearly was at peace, exuding calm acceptance, poise, and certainty. In his address to us, he spoke several times of the journey, and I believe he was asking us to say yes as well and accompany him on the road ahead. A shallow and vindictive part of me is delighted that the secular press must be confounded by this man. But I do have enough compassion and charity to pray that they will come to recognize the truth of him and what he will show us in the days to come. 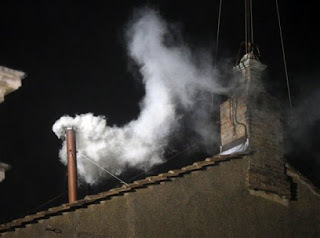 While the world continues to debate the same old issues, Francis is going to reveal truths about caring for the poor, simplicity of life, and humble service. That is a mission I say yes to. Three men who said "Yes"
O my goodness... is that a photo of now-Pope Francis with the other two?!?!? I am stuttering! What a find! Thanks for a really good post. Yes! John Paul II, Benedict XVI, and Francis together. I'm not sure when the photo was taken, but I'm very glad it was!